I have been meaning to write this for quite some time. I think many people will find it useful because there is a huge amount of misconception about what wind turbines can do and what they can’t do, so before you go wasting your money or setting yourself up for disappointment please give this a read. For our international readers please note that what is written here is globally common so although I may make reference to South Africa the actual content holds true for all wind turbines regardless of your location. Also, the wind turbines I am referring to here are domestic/light commercial class wind turbines, so that’s pretty much everything from 300watts to 10kW either horizontal or vertical axis (I will explain the difference). I come from a true renewable background. By this I mean that I am experienced in numerous technologies associated with renewable energy. Now this may sound like a casual statement but there are actually not many of us here in South Africa mainly because few people were stupid enough to try and sell renewable energy products before it was financially viable. I always say to clients that you can tell the age of a renewable energy company by their product grouping. Companies that primarily sell solar (PV) systems are generally start-ups without long experience (relatively) in renewable. The reason I know this is because true renewable companies started in a time that the cost of a solar panel per watt was around R63 ($5.25) and the only people that ever bought them were extreme tree huggers and high sites that simply had no other choice. This meant in order for us to stay alive as a company we had to sell technologies that had some semi semblance of financial practicality. Enter micro hydro turbines, wind turbines and to a lesser extent gas turbines, but so as not to digress I will stick with wind turbines in this article and cover micro hydro turbines in another article. Selling wind turbines is a hazardous business primarily because people don’t understand them or rather have false expectations of them. I will address these first so as to inject the basics. Type of Wind Turbines and Why? The most commonly sold wind turbine in the world is horizontal axis, the reason for this is that they are simply more effective as they front up with the wind and produce power with greater efficiency per swept area. In the picture below you can see a horizontal axis turbine, the horizontal part is that the head and internal generator are horizontal to the ground. Swept area is the total reach of the blades from tip to tip. The problem with horizontal axis turbines is that they require clean wind in order to operate at their greatest output and since they are installed low on the ground, typically 6 – 12m, the air can get extremely turbulent do to any multitude of obstacles obstructing its free movement. Turbulence can cause the turbine to lose its track out of the wind and reduce power as it does so. This can be seen by the wind turbine being unable to stay on a single line against the wind and instead keeps turning away. Manufacturers of wind turbines are well aware of this problem and have come up with various methods to reduce the effects of turbulence or dirty wind on the turbine. Common mechanical methods are long angled tail turbines (very common) and computer vane-controlled turbines (mainly in large units) but another way to completely overcome the problem is by using vertical axis turbines. 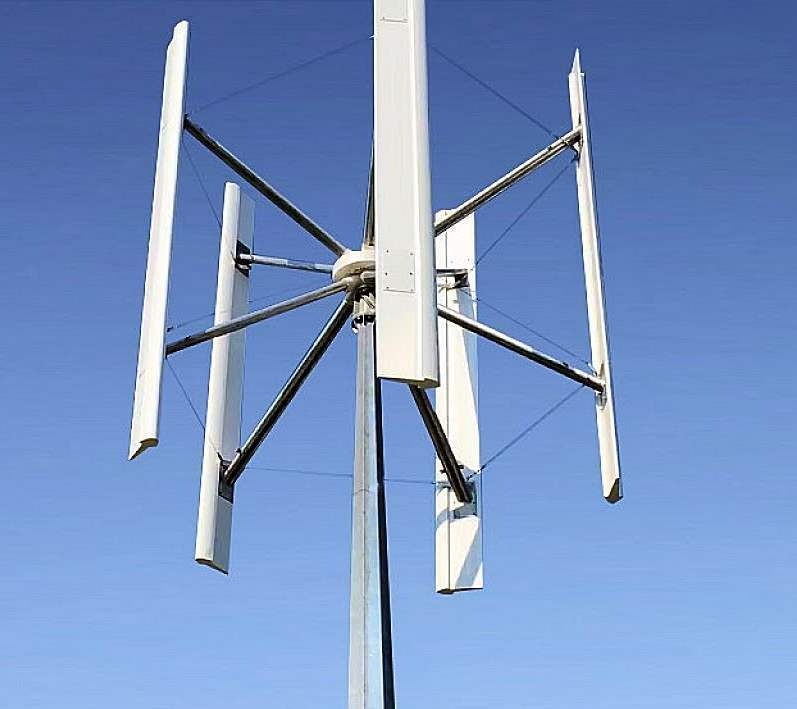 These turbines have a dramatically reduced impact by turbulence since they spin on a vertical plane (angled up from the ground) and thus can convert both turbulence and multidirectional winds into useful wind for generation. 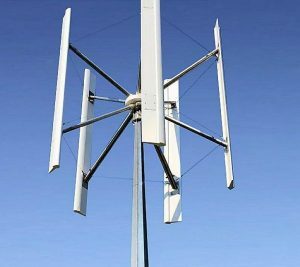 This may seem like a logical step, but vertical axis turbines pay a price of lower rotational speed since they are not fully fronting up with the wind. In addition to this the swept area of the turbine needs to be significantly greater because there is less direct energy being transferred to the heads internal generator. Finally, since demand for vertical axis turbines is lower the cost of buying in a unit is that much higher. Why do I provide you with all this information? Because clean wind is key to good generation for almost any type of wind turbine. That means as few surrounding obstacles (trees, buildings, towers, mountains etc) as is possible, and if obstacles are unavoidable then as far or high from them as you can possibly can. Don’t go thinking you can install a turbine in your backyard that has a tree line between the turbine and the predominant wind, you just asking for frustration. Wind turbines are normally rated (watts or kilowatts) at wind speeds of 9m (29.52 feet) per second which amounts to 32.4 kmh (20.13mph). 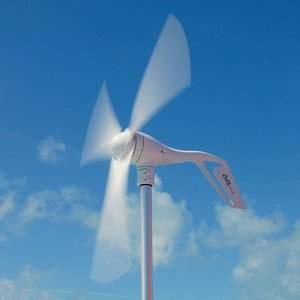 As an example, a 1kW wind turbine is rated as 1kW in 9m/s wind speed. This is no joke for two reasons. First, a wind turbine rated at 1000watts requires a persistent wind at its rated speed to achieve 1000w. This must not be interpreted as a sporadic wind gust at the rated speed, it quite literally means a wind turbine not turning away from the main stream of wind (turbulence) and that main stream of wind persistently flows for 1 hour at the rated wind speed. This happens relatively infrequently even on the best wind sites and if it does, it’s for a couple of hours and certainly not for 24 hours. To put it in a more natural perspective. If you are driving down the road at 32kms (20mph) and you put your hand out the window, the wind resistance you feel on your hand would need to remain like that for 1 hour just to achieve its rating of 1000watts. Again, wind turbine manufacturers are aware of this and for this reason they focus on the start up wind speed which can vary between generator types, makes and sizes but is generally accepted at around 2m/s (7.2kmh/4.5mph). Below you will see a graph. 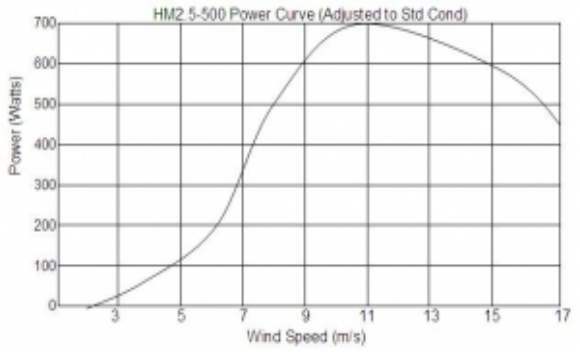 This graph is common with wind turbine spec sheets as it reflects the power generation at lower wind speeds. As you can see the power generation stays relatively low at low wind speeds and only as it nears its rated speed does it take a steep climb. What does this mean? 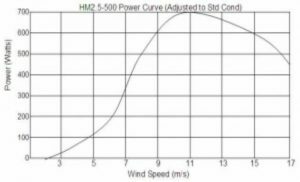 It means at lower wind speeds you are generating power but not much power relative to the rating of the wind turbine. It means that when you are standing on your patio and feeling a stiff breeze on your face that that breeze may not actually be sufficient both in terms of wind speed and in terms of clean wind. Naturally frequency of wind is also important. If you do feel a breeze on your face while standing on your patio how often does that happen? Does it happen every day? Every month? Is it seasonal? If the wind does blow every day, how long does it go for and at what speed? All of this information is what you should be collecting to start building up your decision to buy in a wind turbine. Remember that merely because you notice the wind does not necessarily mean it has a frequency that will make it a viable investment both in terms of cash and in terms of energy. Many clients staying in rural or open suburbs often approach us to buy in 2kW or greater wind turbines. I tell them no. Why? Because in suburban type areas even with big yards wind turbines can be scary. Really scary. A small 500watt HM class turbine has a swept area (spinning rotor diameter) of 2.5meters/8 feet. This swept area increases as the wattage increases. By the time you are at 2kW your swept (depending on make) is at 5meters/16 feet. This is all fine and well when the wind is low or average but when the first storm front strikes with gusting wind speeds nearing 80-120kmh/49-74mph a turbine standing at 9-12m/30-40feet (near the top of your house) with blades spinning so fast you can’t see them takes on a wholly new meaning, if not to you, to your neighbours. Your mind will drift back to every bolt you tighten, every blade you fixed and the cable you ratcheted tight. This is even harder for those people who never installed it themselves. Ironically wind turbines are designed to accept this kind of punishment. They are tested up to 180kmh/111mph. They will really be okay in pretty much anything outside of freak storms that would take your roof off anyway. Most turbines have built in protection mechanisms that turn them out of the wind in extreme weather, they stop generating power or choke back power and either lift vertically or turn horizontally. Still doesn’t make it a pretty sight for you the homeowner. Installing a wind turbine is no simple task and requires planning. When you get your turbine its not merely a matter of putting it on the pole and lifting it. You need to remember that the turbine will be up there for quite some time and some tricks can really make it a great success or huge irritation. Take the time to sight it properly. Look at the area carefully, watch it for a few weeks, see where the wind is coming from and how its moving. Clear if need be. A guy wire turbine requires a super powerful centre that must be perfectly level. This is the one important part of the mast installation. A level centre with a good foundation and super strong concrete/ guy wires. Always error on the side of caution when sinking your base plate hooks into wet concrete. Grease your turbine at all joints with generosity. This grease will protect exposed bolts and joins from the weather. While on this subject we commonly have requests as to whether turbines can be mounted to a building/home. The answer is yes if your turbine is really small (think Air X) but no if you are looking at large turbines in terms of physical size or rated wattage. Just to be clear, you can mechanically affix it to your house but very few things will stop the vibration down the tower and into your walls. So wind turbines don’t work? Try and obtain as much wind information as possible. Check windfinder.com to see if someone has a meter station near you. If not, try the met office, if not the met office when driving about see if you can see any anemometers or wind vanes and ask them to share the data. The point is don’t merely rely on what you feel, try to obtain the data freely first. If you intend to buy a larger wind turbine, check online to see if you can cheaply buy a anemometer and wind vane. Place it roughly at the site that you intend to install in and meter the reading for a few months. Pick an area that has as much clearance between it and any obstacles as possible yet is in the main flow of wind. If necessary clear the area but don’t go overboard, no wind turbine output can justify cutting down a tree that’s been growing for 30years. If you have neighbours discuss it with them. Depending on the size of the turbine, check the ground for ease of installation. Plan it properly and step out the guy wire stay sites and main tower sites. If you have done all of the above, send us or your local service provider all the information you can. That’s it. I hope this article was not too long, ironically, I actually had to shorten it so as not to lose you. If you need any assistance, please don’t hesitate to drop me an email.